If you like playing shooting games on your iPhone or Android handset, we’re about to completely blow your mind because you aren’t having nearly as much fun as you could be. The Osstek Bluetooth AR Game Gun is a video game controller for smartphones that’s unlike anything you’ve seen before. It connects to your phone wirelessly and then it has a mount on top to hold your handset. Watch your game on the phone’s display and pull the trigger on the gun to shoot! Easy to Use:You just need a smartphone and work with AR-gun APP to provide real world and virtual game worlds to enhance the real experience of the wonderful integration, allowing players to enjoy the virtual reality through visual, auditory, and sports. 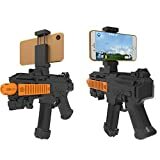 Strong Compatibility: The Augmented Reality Gun is equipped with an adjustable cell phone holder, which can adjust to the width of 2.16inch-3.7inch cell phones. Suitable for iPhone 5/5S/6/6 Plus/6S/6S Plus/7/7 Plus, Samsumg Galaxy series and other Android phones and connected via Bluetooth. Eco-Friendly Material: Light-weighted & eco-friendly OSB material. It is portable & safe for players,fixed by screws with smooth surface.Low power consumption: 2 X AAA batteries are needed. (batteries are not included). Bluetooth Connection: Downloading AR-GUN APP by scan the QR codes or from google play or app store, and pull the trigger for 3 seconds to easy connect to your cell phones via Bluetooth, wireless, steady and low power consumption.